You’ll love how easy it is to put this slow cooker Mexican style chicken recipe together. And you don’t even need the whole day to cook it. That’s because if you set your slow cooker on high, this easy shredded chicken recipe cooks up in only four hours. Plenty of time to drive to the store, pick up all the ingredients you need, and get this easy party recipe going in your Crock-Pot and done before the Big Game starts. Normally, this can be served as an shredded chicken burrito recipe or an easy shredded chicken taco recipe. However, I’ve elected to serve it on brown rice as a “burrito bowl.” With everyone’s eyes on the game, who needs something messy like a taco running down your arms or falling into your lap? 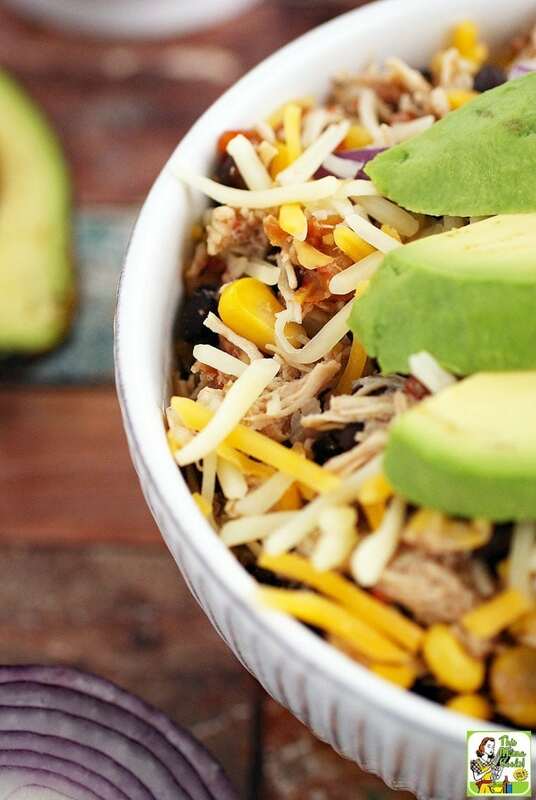 It’s so much easier to sit there with a bowl of Crock-Pot Mexican Shredded Chicken with Black Beans & Corn while you’re cheering on your favorite team, don’t you think? My Crock-Pot Mexican Shredded Chicken with Black Beans & Corn recipe requires a six-quart slow cooker and has just enough room to spare. If you don’t have a six-quart slow cooker, I suggest dividing the food evenly into two smaller slow cookers. For easy cleanup, use slow cooker liners. They’re such a time saver that you’ll wonder why you didn’t always use liners! Stock up on slow cooker liners on Amazon at a great price. You’ll love ‘em! Make brown rice in a rice cooker. That way it can stay warm throughout your football watching party to serve with this easy Mexican style shredded chicken recipe. Set this up buffet style, but show your guests how to make this easy shredded chicken recipe. Explain that you first put the rice in the bowl, then the shredded chicken. 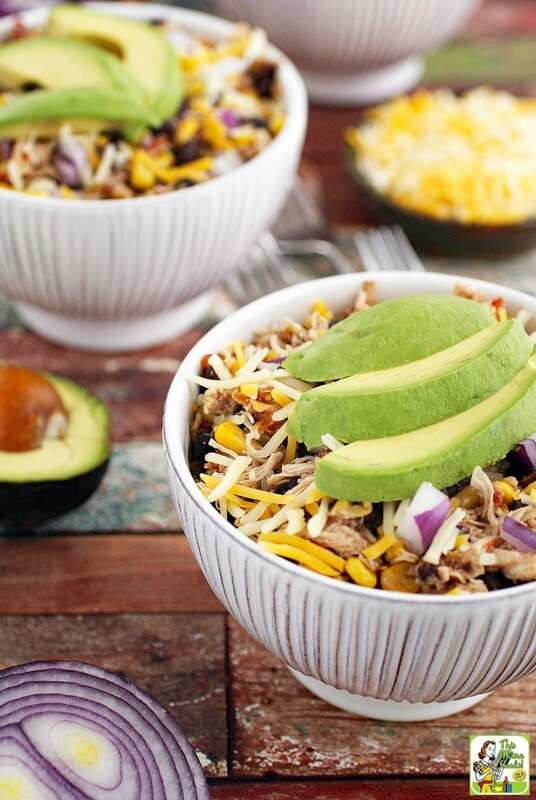 Then you add the toppings to the Mexican style chicken bowls like shredded Mexican-style cheese, diced red onions, avocados, and a squeeze of lemon or lime. To spice up this slow cooker shredded chicken recipe, try a Mexican style hot sauce. Need a party drink suggestion to go with your Mexican shredded chicken bowls? Try my Best ever margarita recipe: Peach & Cherry Beer Margarita! Leftover Crock-Pot Mexican Shredded Chicken with Black Beans & Corn can be served in sandwich wraps or mixed with a little mayo and served like a chicken salad sandwich! Looking for more slow cooker chicken recipes? Try Slow Cooker Buffalo Chicken Sliders. 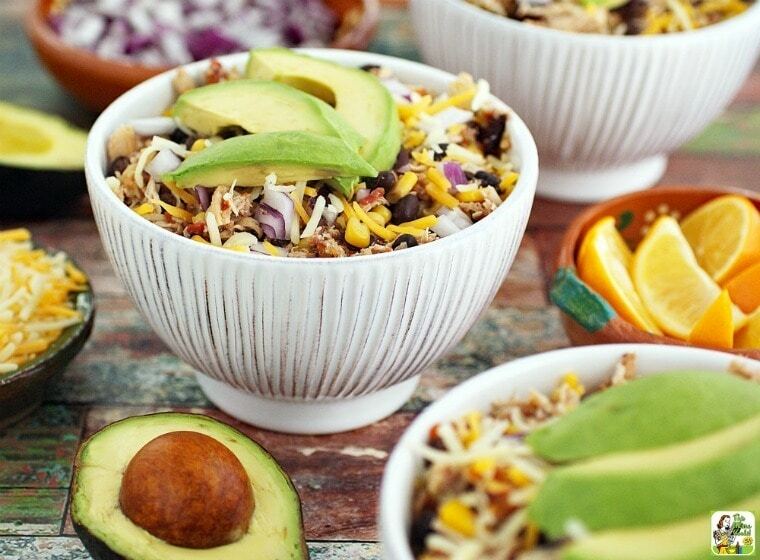 Serve with Mexican style shredded cheese, avocado, hot sauce, chopped onion, and slices lemon and limes. Spray the inside of the crock with cooking spray. Place chicken breasts at the bottom of the crock. Place the RO*TEL tomatoes, crushed pineapple with juice, drained corn, drained and rinsed black beans and sea salt on top of chicken breasts. Using a large spoon, carefully mix ingredients except for the chicken, which should be left on the bottom. Cover and place on high for 4 hours or on low for 8 hours. An hour before chicken will be ready, make enough rice to serve 10-12 people. When chicken is easily shredded with a fork, remove all ingredients with tongs and a slotted spoon. There will a lot of liquid in the crock, so you’ll need to strain it. Set the liquid aside temporarily. Shredded the chicken with a fork and place all the food back into the slow cooker. Mix all the ingredients until they’re thoroughly incorporated. Place your slow cooker on the low setting, if it has one. If not, turn it off and unplug it. Taste the chicken. If it’s dry, add back some of the liquid you removed and taste again until you’re satisfied. Toss any remaining liquid. 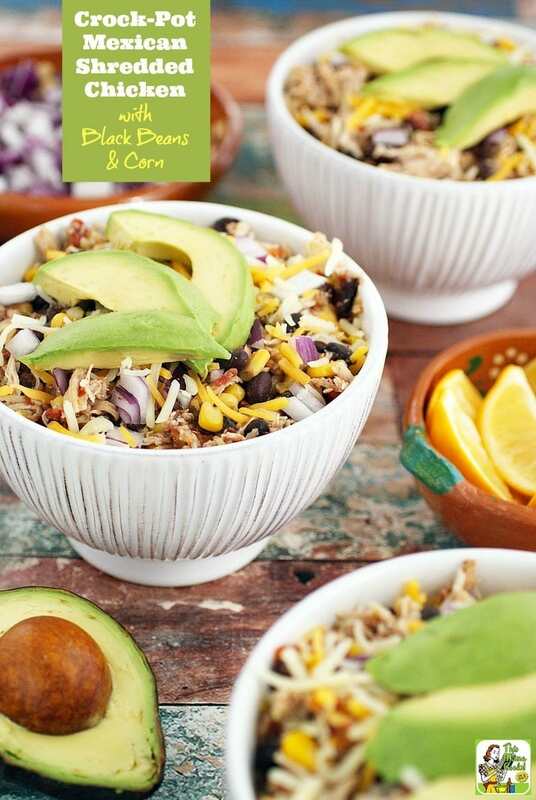 To serve, place brown rice in bowl, put some of the shredded chicken on top, then add toppings such as shredded cheese, avocado, chopped onion, hot sauce and a squeeze of lemon or lime. Enjoy! Posted in Crock Pot and Slow Cooker, Gluten Free, Recipes and tagged chicken, party food, rice on January 23, 2017 by Anne-Marie Nichols. So incredibly delicious! Rotel makes everything so tasty, I use it in chili and of course cheese dip! For me, ROTEL is for slow cooking. I use it in a several of my go to slow cooker recipes. Love how quick and easy this recipe is to make. It takes no time at all. That’s what’s so terrific about it! I love having slow cooker recipes in my stockpile for weekday cooking! I love those Diced Tomatoes with Lime Juice and Cilantro!! That was a new flavor to me. I really like it! EXACTLY my kinda recipe! I am making this, and pinning it! What a great dish for a party! I love the depth of flavor from Rotel tomatoes!! Terrific recipe. Wow! This sounds fantastic. I can’t think of any flavors I love more and especially if they are in my crock pot (no work!). Such an easy recipe. It took no time at all to set up. And the leftovers were yummy, too, especially mixed up with a little mayo in a wrap sandwich! Great recipe! All the ingredients sound so delicious and yummy, and the steps don’t sound too difficult to follow. Great photos, too! Thanks so much for sharing your wonderful recipe.